Complete challenges, earn rewards, repeat. Taking a page out of The Division’s playbook and releasing it soon, Ubisoft Montreal has added Live Seasons to Ghost Recon: Wildlands. It’s currently available on PS4 and Xbox One – PC players get the patch on April 14th. The Live Season is essentially composed of different challenges and lasts six weeks. Complete all the challenges in-game (for which you need to be online for) and you’ll earn unique rewards throughout the season. 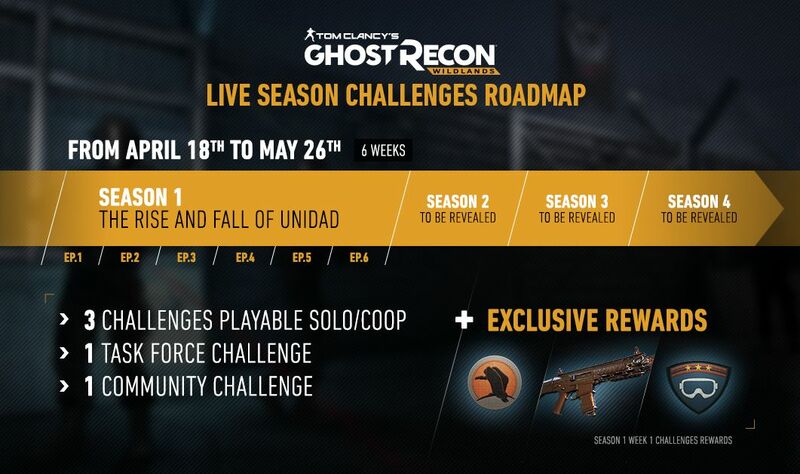 The current season is themed as “The Rise and Fall of Unidad” and lasts from April 18th to May 26th. Challenge reset every Wednesday, 9 AM GMT and completing them all grants a reward which each season offering three in total. Players are given five missions to play each week and there are three different tiers for the challenges you need to complete: three for Solo play (can be played in co-op but only individual stats factored in); one for Task Force members; and one community challenge that requires participation from all players.